Segunda Dimension is a portable tool for sizing digital photos and images. It also provides several functions for general adjustment of the resulting image, in particular as regards the quality of the output (using suitable compression) and used filters. Application allows batch (bulk) processing of multiple files simultaneously. In addition to determining the precise dimensions and offers customization aspect ratio. It's basically an image resizer that allows you to process individual or multiple files in an effortless, convenient manner and provides you with various customization options. Working as a photographer, regardless of your skills, might sometimes involve you having to edit material on your PC, in terms of conversion or resizing. Third-party software solutions, such as Segunda Dimensión, can save you from a lot of hassle by providing you with efficient image resizing features. This program is portable, therefore you are not required to install it. It does not create any additional folder on your computer, nor does it tamper with your Windows registry entries. It is a lightweight utility that packs a sleek, minimalistic layout, thus allowing you to access its functions easily, without spending too much time looking for them..
You can rely on this application if you need a convenient way to resize image content from your computer. Thanks to this tool's batch processing abilities, it is possible to process multiple files at once, thus saving you the hassle of handling each file manually. Furthermore, you can open a configuration window that comes with a wide variety of customizable parameters, such as filter settings and format-related attributes. 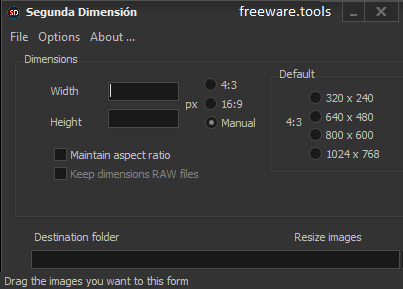 To sum it up, Segunda Dimensión is a lightweight, reliable application that allows you to resize individual or multiple image files from your computer in a quick, efficient way.